Ships arrive into Kenosha in a grand Parade of Sail along the Lake Michigan coastline. 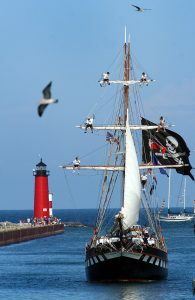 After mustering outside Kenosha Harbor at approximately 3pm, they will sail north to Pennoyer Park, to make their turn. Then they head south, turning at the Kemper Center, before proceeding downtown to their docking location. All activities and timing are weather and wind dependent. Best Viewing on Land: Kenosha has 13 miles of coastline! Best viewing will be between the two turns. You are also welcome to join us along the park downtown. Food and beverages at the CJW/Miller Lite Beer Tent will be available. Please note: No boarding of vessels at this time. Best Viewing from the Water: Yes! You can sail on board a tall ship and see the Parade from the Parade. 4pm Ships head north to Pennoyer Park, 3601 7th Avenue, then head south to Kemper Center, 6501 3rd Avenue, then downtown. 5:30pm Ships begin their approach into downtown Kenosha for docking. 7pm Kenosha Rocks the Dock! Join us for an evening of wind, water and song on the harbor. Tall ship boarding for 3 of the 5 visiting ships, bands, beverages and more. Requires a separate ticket. Tickets go on sale June 3, 2019. 6pm Tall ship boarding ends. Festival closes. Final sail away cruises take place.